from a Christmas Pageant Veteran! When the air starts getting colder & football season is in full swing, my mind quickly realizes Christmas Pageant time is right around the corner! I've been the church Christmas Pageant Director for nearly 16 years now. My first pageant was a COMPLETE DISASTER. The next year was a little better, but only because it became my full-time J.O.B. for two entire months. I was a full fledged Pageant-Zilla that year, and my family will never let me forget how miserable we ALL were as I tried to make that pageant "perfect". Over the years, through lots of trial and error- I've slowly figured out a pretty neat trick. I did a little thinking on what advice I might give to another Pageant Director based on my experience over the last decade. I came up with 7 pieces of advice that I wish someone had shared with me early on. Every child has a talent of some sort. Try to find a way for every child to display that talent and shine during the pageant – be it singing, acting, lighting, costume design or something else. Children in preschool and Kindergarten should have cute but short performances. Tip #3: Have a "Pastor Role"
If possible, have a church leader or pastor play a role in the pageant. Nothing will make the children feel more important and connected as having the head pastor participate. Tip #4: Use What You've Got! Use whatever your church has and don’t be afraid of what your church doesn’t have. Some churches have stages that are on par with theaters, but many of us (my church included) don’t even have a real stage. The children don’t care either way; teach them to creatively work with what they have. The key to a productive rehearsal is to have all hands on deck. Call in as many volunteers as you can to help maintain order during the rehearsal. Do not allow words of thanks AFTER the performance. Words of thanks should come BEFORE the performance. It is extremely anti-climactic to listen to a dull speech when everyone has sensed “The End” and wants to get going. Above all else, know that the families who participate and attend the pageant will be building happy memories in their hearts- of faith & family at Christmas. These are my three all-time favorite pageants that I’ve ever done at my church. They are 100% original and they will work for churches of any size! "The King's Birthday" was designed especially for novice directors who don't have a theater background. 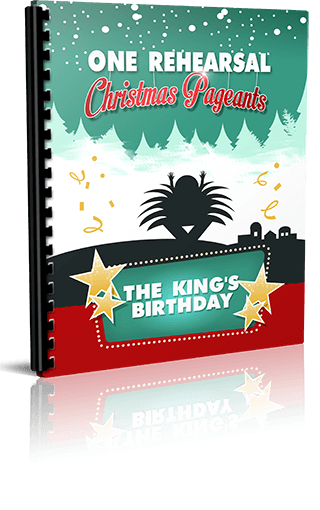 The Pageant is a modern adaptation on the classic story of the Nativity - complete with shepherds, angels, wise men, and a host of other characters that will allow you to make the best possible use of the talent at your church. In fact, I’ve even included two soloist positions that will allow you to spotlight particularly strong individual talent - so if you have a star tuba player or an Irish dancing family, they can be featured! In this Christmas musical, Paula Powers, a young woman with a successful career in television, returns to her home town to produce a Christmas pageant that will show the town how good she is and how much she knows. Lisa, a young girl who has heard the Christmas story for the first time, asks to be an angel. She discovers that her poor family has a lot in common with Mary, Joseph, and the Shepherds. When she hears that neither these characters nor the angels are part of the show, she drops out. Paula realizes her error and sets things straight. Let’s Keep God’s Love in Christmas” is an original pageant with a fresh, modern story to frame the birth of Jesus. Mrs. Bartlett, a theater professional, is determined to produce a meaningful Christmas Pageant for her church. En route to the first rehearsal, she finds herself delayed by an accident, which puts her at the disadvantage of being late. To make matters worse, teen performers are texting, joking around, and complaining about how parents force them to be in the pageants. It doesn't look like the pageant will happen. However, news from the deadly crash serves as a catalyst for the performers having a complete change of heart and wanting to support the true meaning of Christmas in a great show. Shepherds, camels, wise men, angels and all the traditional players meet up with a modern situation in a Pageant that shows how God's love is the same yesterday, today and forever. In other words, with this package you get all the components you could possibly need to make this year’s Christmas pageant fast and simple to stage, fun to perform and wildly entertaining to watch! So, instead of a NEW script this year, I've bundled up my "Top 3" Christmas Pageant Scripts from years past and I'm going to give them away at as a "Package Deal" at a blockbuster deal. But this year, I want to encourage some of my customers who have had a severe "Christmas Pageant Phobia" and give everyone an offer that's hard to pass up. So this week, you can get ALL THREE scripts, for just $9. Yep, that's only $3 bucks each. I know, I'm crazy. You see, I really don't see these scripts so much as "money makers", but more "memory makers". My children have such positive memories associated withing being a part of the Pageants, I want to share that feeling with as many kids as possible. And I hope this pricing allows everyone who WANTS to put on a Christmas Pageant the ability to DO IT. 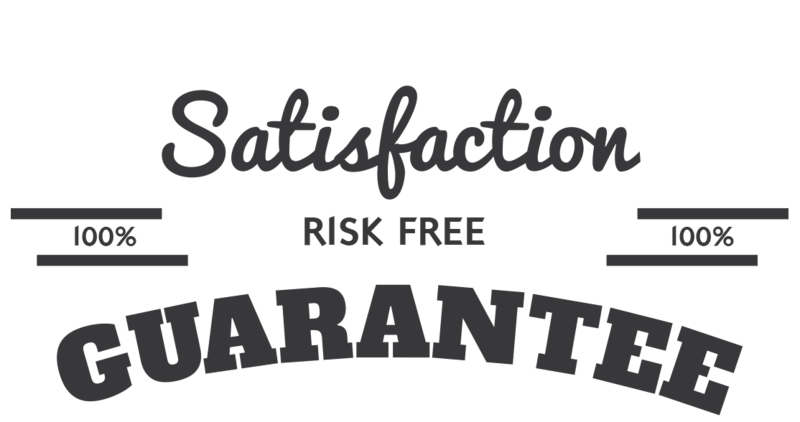 That’s right, we are so sure that you will love the Christmas Pageant 3-Pack that we are offering an unconditional 100% money-back guarantee. 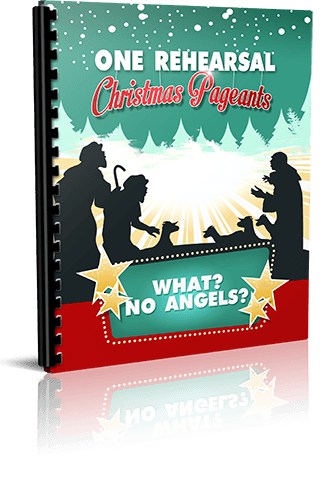 Creating a Fun, Entertaining Christmas Pageant Doesn’t Get Any Easier Than This! We all know that the Christmas season is one of the busiest times of the year … a period when few people have the time to attend multiple Christmas pageant practices. This package offers a solution to this very common problem. You get three fun, entertaining scripts that your actors can master in just one rehearsal. That means no stressing trying to arrange practices so that they fit in everybody’s busy schedules … as well as no pre-show worries about whether your actors really know their parts. 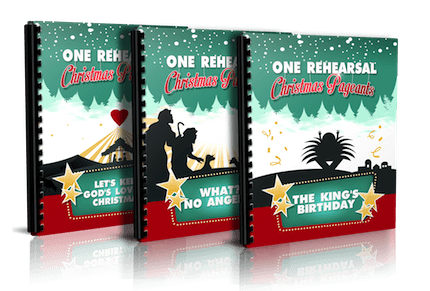 With this package you’ll feel totally confident that this year’s production is going to be your church’s best Christmas pageant yet! YES, I want in! I want access to the Three Christmas Pageants that I can use over and over again. Please give me INSTANT access right now! 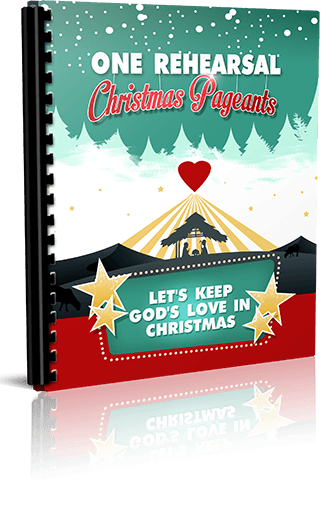 Our Christmas Pageants are geared for kids ages 3-18, we know that churches of all sizes & various age groups have successfully used our pageant scripts.